Bridgetown PA (Coatesville) lives up to its NE#1 ranking in a big way, pulling away from a huge pack in the last inverval. Steve Murdock NY 16:38 wins. 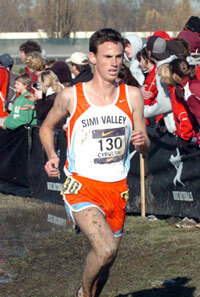 Ben Johnson NM and Michael Cybulski CA win Foot Locker Finals berths. It took several months and one very special invitation, but the boys from Pennsylvania FINALLY trekked across state lines. Bad news for those other 49 states. 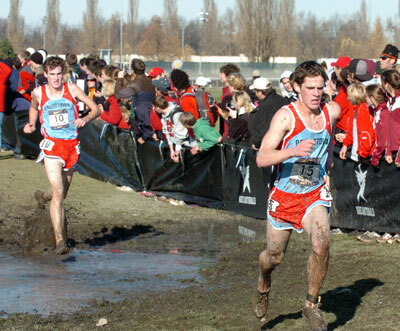 Even with its frontrunner slowed by a slight off day, the depth displayed by the Bridgetown Cross-Country Club proved far more than the trusted national mega-powers could handle during a mud-stomping, lactate-building challenge at Nike Team Nationals III on Saturday afternoon at Portland Meadows. Bridgetown, which gapped just 51 seconds while sporting the fastest 4th and 5th scorers in the entire race, shaved nearly 20 points off its running score in the latter half of the competition to win going away, 126-148, over runner-up Simi West of California and third-place Spokane of Washington (162). 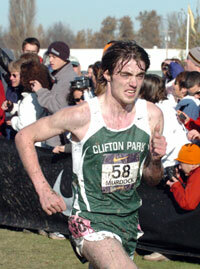 Steve Murdock, a senior from Clifton Park XC, won the race in 16:26 under very adverse course conditions. 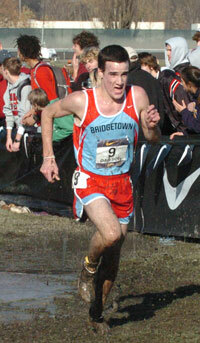 Kyle Dawson, Bridgetown's #1 runner, finishing 8th. Sean Ward and Owen Dawson, who finished 20th and 21st. "We came in, I think, still a bit under the radar to some skeptics," Bridgetown coach Keith Andrew conceded, "but we came out of the mud as champions. It really hasn't settled in yet... This is a dream come true." The winning squad, whose members competed for Coatesville High during the high school season, clearly shut the door on the top-notch competition over the race's last eight minutes. But the victory truly began taking shape more than 24 hours earlier. As meet participants began their day-before course run-throughs, the soggy 5,000-meter layout took a major beating, wearing away at what had been a surprisingly manageable damp-grass, mud-packed infield layout at week's start. By early afternoon on Friday, deep streaks of paved mud became apparent along the course, signaling a downward change in the course's footing. By late afternoon, the scene had endured a massive change, with large sections of mud resembling a pig's trough. Firm spots were very few and far between. Being new to both the course and the NTN experience, Andrew and assistant coach Dave Lapp admitted they were concerned by those course developments despite mentoring a strength-oriented lineup quite familiar with challenging courses. "But then last night the kids told us they were confident," added Andrew. "They told us, 'Coach, we're ready. We know we can run in the mud. We're set to go' After that, a calm came over us and I just had a great feeling about what was going to happen today." Sean Ward and Owen Dawson provided great performances to finish 20th and 21st fo Bridgetown, with Tom Pannulla (32nd) and Jason Leonard (45th) closing out the scoring. As the 5th runner on the winning team, Leonard also earned the meet's "Golden Anchor" award. Andrew Mahoney and Chris Rosato rounded out the championship effort. All five of the team's scorers were seniors. Second was Simi West CA (Royal) which was victim to Hills' (Trabuco Hills) mind-blowing and historic effort at the recent California state meet. The key to the team's runner-up placing centered on junior Alex Routh's #2 finish in the team order, Routh, often the team's fifth scorer, was only 34 seconds behind Cybulski while on the slowest course this season. "It was amazing... I was very proud of their effort," said Royal HS coach Ryan Luce, who was not allowed by CIF-SS rules to coach the team in the unsanctioned postseason event, but was permitted to attend the event and interact with the kids after the race. Murdock, who previously qualified to represent the Northeast Region at next weekend's FootLocker Cross-Country Championships, was easily the class of the field. Mired in the penultimate challenge of a six-week stretch of championship-type efforts, Murdock was content to share the lead over the first three kilometers as his pre-meet plan called for. "Then it was time to go," said the Syracuse-bound senior and New York State champion. "When I made my move, it felt great. No problem at all with my legs or the mud." Technological Bells & Whistles -- From the meet that brought you automated in-race "quick scores" and mega-sized video screen race footage in its initial versions of NTN, the technological growth of the event continued in 2006 as a live Web-cast was beamed around the world. Early data figures reveal that more than 80,000 DyeStatters tuned in to the 3-hour live feed, which included real-time footage of both NTN championship races; vignettes on select competing club teams; interviews with such Nike elite athletes as Adam and Kara Goucher, Paul Tergat, Dathan Ritzenhein, Alan Webb, and Bernard Lagat as well as webcast commentary from Nike elites Alan Culpepper and Lauren Fleshman. All told, there was more than a 50% increase on race day over previous DyeStat records for online traffic in terms of sessions and page views. "The new resources, talent and leadership brought to bear by Student Sports are taking DyeStat to a new level that I couldn't have imagined two years ago," said DyeStat founder John Dye. Participants in the NTN championship races were greeted by a series of three fireworks blasts shortly after the starting gun sounded as the combatants scurried along the opening stages of the course. Setbacks -- Teams always aim to put their best collective feet forward on race day, but such does not always happen. Two clear instances impacted the final results. First was the discovery of an early outbreak of a gastrointestinal virus spreading through the team camps. The first case to come to light centered around Potosi's Josh Thebeau, who was sent to the hospital to help treat the condition. Thebeau also struggled the weak prior in finishing at the back of the pack in the Foot Locker Midwest Regional. Two other runners were felled by the virus that were readily known. The other notable mishap occurred at about the one-kilometer mark as a series of runners took a spill, leading to a major chain reaction of collisions. A video screen replay revealed a few dozen runners were eventually swallowed up in the mass pileup, with most falling, then struggling to get to their feet, only to fall again. Elmhurst XC Club (with members competing for York HS of Illinois during the high school season) was among those hardest hit by the logjam, as five runners reportedly lost their footing at that point. Contacted later, several Elmhurst team members confirmed the incident claimed most of their team members but quickly and staunchly refused to attribute their surprisingly mediocre middle-of-the-pack showing to those developments, instead citing "we just didn't come ready to run today." For the second consecutive year, the California Region is making fine headway on the national scene. After boasting two teams in the top seven in 2005, the Golden State boosted its credentials with two teams earning podium spots in 2006. Simi West led at one point in the race but then was overpowered by the strong-closing Bridgetown crew. Carmichael (Jesuit HS of Sacramento), a squad which a few experts internally agreed earlier in the year could win NTN by season's close, managed a very impressive fourth despite needing an at-large berth to be invited. California not only had the best regional showing through two spots, but going three deep as well. Hills XC Club (Trabuco Hills HS of Southern California during the prep season) endured a rough 9th-place showing at NTN just seven days after establishing a state course team-time record at Woodward Park. Davis, a Northern California squad showing at least as well as Jesuit during the closing weeks of the high school season and was projected by the author of this story for a Top 10 a NTN, was not invited, Data over the last 7 weeks suggest this was clearly the deepest pool of boys team talent in California history. Although courting only two qualifiers to NTN, the Northwest had its best showing to date as Spokane XC (Ferris HS) and Mead XC (Mead HS) placed third and fifth, respectively. The reason for the regional breakthrough was the fine showing by Spokane XC, which placed 13th and 10th in previous versions of NTN despite being projected as a top 5 finisher each year. The Ferris jinx at NTN is officially terminated. Mead XC achieved its third top 5 finish in NTN annals, (3rd in 2004 and 4th in 2005), with its aggregate place total of 12 "points" over three years matching Royal (4th in 2004, 6th in 2005, 2nd in 2006) as best in NTN's short history. Central Valley, another excellent Washington team up for strong consideration as an at-large entry, also was not invited. Bridgetown's win was a great topper for the Northeast Region performance ledger at NTN, but it was an overhauled and improved Clifton (Shenendehowa) squad that placed 6th to give the region a very respectable look yet again. "Shen", paced by race winner Steve Murdock, joined Mead and Academy as the only teams with two runners in the Top 15 (Zach Predmore placed 15th for the New York school). Danbury, the top squad in a fine year for Connecticut teams, placed a distant 18th here as frontrunner Will Ahearn was wearing a boot cast this weekend, sidelined by a stress fracture. Four of the remaining five regions were fairly balanced in aggregate performance, with the Midwest noticeably hurt by the large spill of runners occurring about three minutes into the race. Both Elmhurst (York) and Cincinnati, OH (La Salle HS) fell victim to lost positions during the snafu, The Southeast Region, which appeared overmatched in seasonal and final results during the first year of NTN (2004) before improving noticeably last year, again came up on the short end as its two representatives placed 14th and 20th overall. The four at-large boys teams placed 9th (California Region), 17th (Midwest), 18th (Northeast) and 19th (Southwest). Foot Locker qualifiers -- The annual race-within-a-race took place between certain combatants as two berths for next weekend's FootLocker National Championships were up for grabs. The qualification criteria was simple: The first two boys finishers in the NTN race that reside in those states that also comprise the FootLocker West Region would gain the berths, helping complete the 40-runner boys field. Ten runners each from the Northeast, South and Midwest regions previously qualified last weekend, joined by eight others from this weekend's FootLocker West Regional at Mt. SAC. Senior Michael Cybulski of Simi West was XC Club was favored for one berth, while Spokane XC's Cameron Quackenbush and Academy XC's Ben Johnson were projected to battle for the second spot. Johnson actually pulled into the lead pack during the second kilometer, with Cybulski's conservative approach seeing him move up from 16th late in the first kilometer. By the race's midpoint, Cybulski was tailing close to leader Steven Murdock of Clifton (Shenendehowa HS), but the New Yorker soon made an unmatchable move to position himself firmly for the win. "I tried to go with him, but at 3k he just began taking off," said Cybulski. "He was just too strong at that point, so I had to work hard to make sure I was top two from the West from there." Johnson, who runs for perennial power Albuquerque Academy during the regular season, moved past Cybulski with about a kilometer remaining, then withstood a few challenges to place second to Murdock (16:26 to 16:37). Cybulski claimed the final berth to FootLocker, taking third in 16:41. 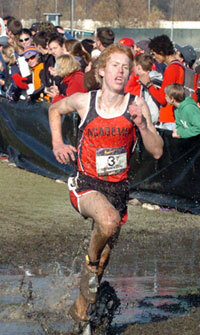 Spokane's Quackenbush -- 5th in 16:44 -- will serve as the West Region's alternate for FootLocker. Both Johnson and Cybulski will be hard-pressed to recover from the challenging Portland Meadows course, which leaves participants heavy legged for several days after the race.